Michigan is brimming with spooky stories and terrifying tales. Whether you’re warming up at a bonfire with your friends or trying to spook your younger sibling, these 10 myths and urban legends are stories to be told. Read on if you dare. Throughout the United States in 2016, there were sightings of individuals—sometimes groups of them—dressed as clowns and chasing, menacing, or just plain old creeping out the public. Michigan is no exception, a cursory search reveals a pair of teenagers finding a clown around Flint near the Kimberly Oaks home, as well as a report of a clown near Big Rapids, a clowny trio in Dearborn, and one arrested in Kalamazoo near Loy Norrix school. Michigan is full of squirrels, but the question is, which of these squirrels are evil? Michigan is one of a handful of places in the United States where black squirrels can be found, reports note, but many consider these little guys to be harbingers of evil. However, the black squirrel may not be Michigan's true evil at all, as Kellogg's cereal founder W.K. Kellogg was said to have imported black squirrels into Michigan. This wasn't a curse on the state, but rather, it was a measure to counter what Kellogg apparently considered the real evil: red squirrels, which were overpopulating his company’s grounds. So, which squirrel is the true monster? Jimmy Hoffa's disappearance is one of the longest-running mysteries around, and Michigan is home to at least a couple potential sites of his burial. Hoffa was an American labor union leader who disappeared in July of 1975. A northwest Detroit home may have played host to Hoffa's murder, some reports note, and a Milford Township horse farm may have been his burial site. Of course, there are a lot of mysterious sites for Hoffa's death and/or burial, but Michigan has its share of possibilities. Lake Michigan travelers be warned, because there's a chunk of the lake that actually has similar properties to the legendary Bermuda Triangle. Connecting Ludington, Manitowoc and Benton Harbor, this large chunk covers almost one-third of the lake's surface. That particular area demonstrates several unusual phenomena, including ships and planes gone missing over the area. Given that the area is substantially broad and mostly water, this isn't too surprising if tragic. Reports of unusual storms over the region, however, are more readily witnessed. With over 1,000 known wrecks, and around 150 of them gone without a trace, there may be something going on under Lake Michigan's expansive waters. In Marquette, there's a small hotel known as the Landmark Inn that's actually quite a landmark in its own right. The hotel once played host to none other than legendary pilot Amelia Earhart, and not long before her death, either. Now, reports suggest she returns to Room 502, where guests have spotted flickering lights and have heard unusual noises coming from under the bed. The Red Dwarf, also known as the "Nain Rouge," is said to be a part of Detroit's history going back to its founding. While original legends consider it to be a protector of the city, updates now consider the Red Dwarf to be a darker sign. The dwarf reportedly attacked one of Detroit's first settlers, Antoine de la Mothe Cadillac, who lost his fortune not long after the encounter. Additionally, it was seen the day before the 1967 riots in Detroit and ahead of the city's worst ice storm in 1976. Now, the city hosts a controversial expulsion ceremony, known as the Marche du Nain Rouge, which features a parade and the destruction of an effigy. Not only is Michigan home to the Dogman, an alleged seven-foot-tall, man-canine hybrid. It turns out that this was just part of the list, as a Bigfoot sighting was recorded between Kalamazoo County towns Fulton and Climax, and two lake monsters are a part of the package, including Pressie near Ontonogon's Porcupine Mountains and the Dewey Lake Monster near Dowagiac. While Pressie is said to be more of a "sea serpent," the Dewey Lake Monster is seen around the lake and a long stretch of unpaved road known as Dewey Lake Street. 8. Michigan is for lovers? Not all urban legends are of the creepy variety, as the state has three separate legends involving young lovers and unexpected kissing locations. At Michigan State University, those who kiss in the shadow of Beaumont Tower—particularly at midnight exactly—are fated to marry each other. A similar sentiment is expressed for the Engineering Arch at the University of Michigan as well as the Warriner Hall Seal at Central Michigan University. The Central story has a bit of a darker twist to it: Two young lovers were set to elope, and planned to meet there that night before leaving. The boy's car broke down on the way, and left him several hours late. A Michigan night is seldom warm, and the waiting young lady froze to death, waiting for her love to arrive. In utter heartbreak, the boy kissed the frozen remains, and died himself. Now, the duo provides an otherworldly blessing to those who meet as they once intended. Why? Because you may want a quick way off Mackinac Island. While Mackinac is known for its fudge, its nigh-total lack of cars and the Grand Hotel, it is also known as one of the state's biggest nexus points for hauntings. 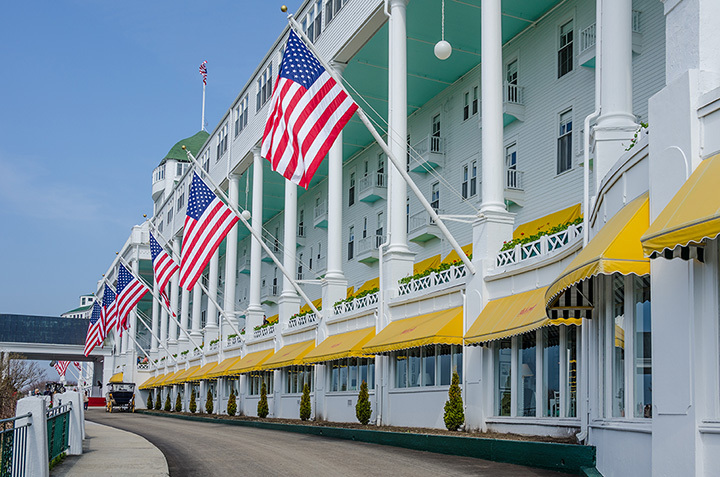 The Grand Hotel was built over the original military post's cemetery, and even the legendary TAPS team from Ghost Hunters took on Fort Mackinac. Though they didn't expressly call it "haunted," several electronic voice phenomena were taken, and the team was said to be impressed. That's just the start, though, as other places like the Bogan Lane Inn are haunted, and even the island's original inhabitants, the Anishinaabe tribes, considered it home to Gitche Manitou, or the "Great Spirit."